Ninety degree days in May are just not right. Don't get me wrong I love a little bit of warm weather, but when it is too hot to want to cook in my kitchen at the beginning of May I know that it is going to be a very long summer. Since the weather has been so warm I have been trying to keep a batch of easy to prepare stove-top recipes. One of my family's favorite type of recipes is pasta. My two boys absolutely adore pasta and could eat it pretty much every day. While my husband and I are pasta fans, we get tired of eating the same dishes over and over again. Therefore I was pleased when the January/February issue of Cook's Illustrated magazine had a recipe for Roasted Red Pepper and Pistachio Pesto for Cheese Ravioli , which looked different than my family's normal pasta routine. This recipe has 9 ingredients. It takes approximately twenty minutes of prep and cooking time and makes 5 servings. I had no problems finding any of the ingredients at my local grocery store and made no ingredient modifications. Instead of raw shelled pistachios I used roasted-salted pistachios. Since my pistachios were already salted I didn't have to add as much salt to my finished pesto. For the ravioli I used fresh four cheese ravioli, which worked perfectly. I followed the remainder of the recipe as written. 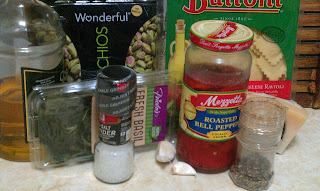 I love pesto sauce and this recipe was delicious! It's a great way to make a new spin on pesto and the roasted red peppers created a great flavor. This dish was very popular with my two boys, they loved it. The only thing I would warn people is that this pesto is very rich when served with ravioli. I think that the pesto might be even better with linguine or another type of unstuffed pasta. Since the ravioli had cheese and the pesto had cheese it was a little rich. Make sure to serve small portions, since a little goes a long way! This recipe is not available online without a subscription,if you have one it can be found here, but it can also be found in the January/February issue of Cook's Illustrated magazine. I think this is a good meal to have to get full with small portions which I'm all about right now. Can't wait to try it! I try to eat small portions also, some meals I do better with than others :) Since this dish is so rich it was easy to stick to smaller portions!